GRAFENWOEHR, Germany — The Army agency that handles the day-to-day operations of all of the Army’s installations is giving its current employees an opportunity to volunteer for career-broadening assignments within the command before considering outside applicants. Installation Management Command’s Voluntary Placement Program, or IVPP, gives first consideration to internal employees wishing to move overseas or return to the continental U.S. from an overseas position. IVPP is a career-broadening opportunity for permanent, appropriated fund employees, which includes GS-9 employees and above and wage grade equivalents. 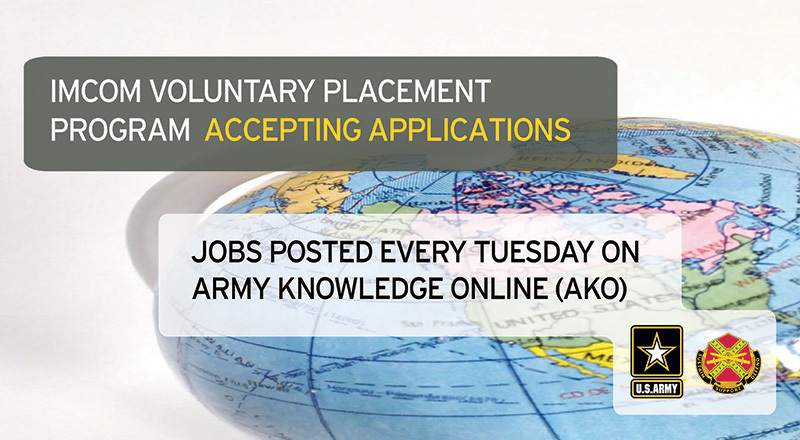 Available job opportunities are posted on the Army Knowledge Online portal every Tuesday. Interested employees are required to submit a resume and application on the portal. Employees are allowed to submit one resume per week. If selected for a position, the employee will receive an official offer through the Civilian Personnel Advisory Center, or CPAC. If you are a CONUS employee, check out OCONUS vacancies at https://www.us.army.mil/suite/page/697591. If you are an OCONUS employee, check out CONUS vacancies at https://www.us.army.mil/suite/page/697837. In accordance with the DOD’s Priority Placement Program policy, valid job offers made under the IVPP will be considered legitimate for IMCOM OCONUS employees registered in PPP. Declining an IVPP valid job offer may result in removal from PPP and may subject the employee to adverse action. OCONUS PPP registrants should submit resumes only for positions they are prepared to accept, according to the IMCOM website. If you have questions, send an email to usarmy.jbsa.imcom-hq.mbx.voluntary-placement-program@mail.mil. How is the IVPP different from the IMCOM Enhanced Priority Placement Program/Priority Placement Program (IEPP/PPP)? IMCOM employees in both OCONUS and CONUS will be able to participate in IVPP and apply for consideration to IMCOM vacancies. IEPP is only available for IMCOM OCONUS employees registered in PPP and enhances the placement opportunities of IMCOM PPP registrants against IMCOM CONUS positions. IEPP is not available for CONUS IMCOM employees. Who is eligible to enroll in the IVPP? Permanent IMCOM OCONUS APF employees GS-09 and above (and wage grade (WG) equivalents) are eligible for consideration for IMCOM CONUS assignments. Permanent IMCOM CONUS APF employees GS-09 and above (and wage grade (WG) equivalents) are eligible for consideration for IMCOM OCONUS assignments. At this time, it does not include opportunities for CONUS to CONUS or OCONUS to OCONUS movement and does not extend to nonappropriated fund (NAF) employees. The IMCOM G1 office will provide applicants updates to their application status through AKO. Hiring managers will receive a list of eligible candidates, they will have two weeks to review and make a selection determination. Hiring managers may contact the employees and interview unless the bargaining agreement or local merit promotion plan requires interviews as part of the candidate assessment process. In those cases, the requirements of the labor agreements/merit promotion plans will be met. Hiring managers are encouraged to vet candidates by obtaining references to verify satisfactory performance and conduct before making a decision. Upon receipt of selection decision from hiring manger, HQ IMCOM G1 will coordinate the selection with the servicing civilian personnel advisory center (CPAC). The selectee will receive an official offer through the CPAC. What happens if an employee declines a job offer through the IVPP? In accordance with DOD PPP policy, job offers made under the IVPP may be considered valid for IMCOM OCONUS employees registered in PPP. Such declination may result in the removal from PPP and may subject the employee to adverse action. Therefore, OCONUS PPP registrants are cautioned to submit resumes only for positions they are prepared to accept. Other employees who decline firm job offers under the IVPP will receive no further consideration under this program. Only region directors for garrison and region employees, and deputy commanding generals for HQ and AEC employees, may approve exceptions to this provision. For exceptions, employees must submit a written request through command channels to the appropriate approving official who will forward their decision to the HQ IMCOM G1 POC. Can/will IVPP announcements run concurrently with USAJobs announcements? Or is it sequential (IVPP Open/close/list clear, then USAJobs open/close)? IVPP announcements for CONUS positions will run concurrently with USAJobs announcements. IVPP announcements for OCONUS positions will run prior to USAJobs announcements. Can/will IVPP and CPAC referral lists be reviewed by hiring officials simultaneously? Or is it sequential (IVPP list issued/cleared, then USAJobs list issued/cleared)? Same conditions as above in Q8/A8. IVPP and CPAC referral lists for CONUS positions may be reviewed concurrently. IVPP referral lists for OCONUS positions will be reviewed prior to a USA Jobs posting or referral list being issued. However, candidates on IVPP referral lists must be considered/selected before a selection can be made from the CPAC referral list (or appropriate approval must be obtained for non-selection of IVPP candidate). How many candidates need to be on the IVPP list for it to be a valid list? If there is only 1 applicant that applies and is qualified on the IVPP list, is that a valid IVPP list? All eligible and qualified applicants will be referred on IVPP referral lists. An IVPP referral list will be considered valid, no matter the number of applicants referred. Can hiring officials opt NOT to select a qualified candidate from the IVPP list and instead select from the CPAC/USAJobs referral list? Non-selection of an IVPP candidate may only be approved by the region director for garrison and region headquarters positions; and approved by IMCOM deputy commanding general-chief of staff for IMCOM headquarters and US Army Environmental Command (AEC) positions. What is the process for hiring officials to reject the IVPP list, or is the expectation that if there are qualified candidates on the IVPP list, that one will be selected from the IVPP list? Why are NAF employees specifically excluded from participating in IVPP? Although the DOD NAF Interchange Agreement allows the movement from NAF to APF and vice versa, it does not allow for the reassignment, re-promotion and/or change-to-lower grade between different personnel systems. IVPP is an internal program that takes into consideration internal employees who are eligible for reassignment, re-promotion and/or CLG within the APF personnel system. As such, NAF employees cannot be reassigned to an APF position through IVPP. However, the NAF personnel system has a mechanism to reassign NAF employees from one NAFI to another, contact your NAF HRO for details. Additionally, we do not anticipate all jobs will be filled through IVPP; all IMCOM jobs posted on USA Jobs will include DOD NAF Interchange Agreement eligibles, affording NAF employees the opportunity to be considered. If NAF employees were previously APF can they participate in IVPP? No, although an employee was previously APF, a current NAF employee is unable to participate in IVPP. Only current permanent IMCOM APF employees are eligible.